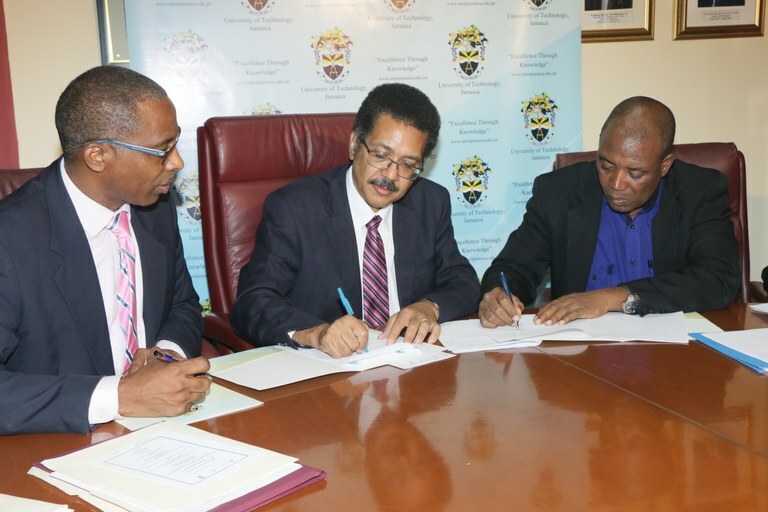 UTech, Jamaica Signs MoU with RADA for Development of MSc in Rural Development — UTech, Ja. Prof. Stephen Vasciannie, President, University of Technology, Jamaica (centre) and Mr. Peter Thompson, CEO, RADA sign a Memorandum of Understanding for the development of a Master of Science degree in Integrated Rural Development, during a special ceremony held on Tuesday, July 11 at the University’s Papine campus. Looking on is Dr. Garfield Young, Dean, Faculty of the Built Environment. The University of Technology, Jamaica (UTech, Ja.) through its Faculty of The Built Environment has forged a partnership with the Rural Agricultural Development Authority (RADA) for the development of a Master of Science (MSc) degree in Integrated Rural Development slated to come on stream in 2018. The two entities on Tuesday, July 11, 2017 signed a Memorandum of Understanding (MoU) at the UTech, Jamaica Papine campus, formally paving the way for the development of the programme. Dean of the Faculty of The Built Environment, Dr. Garfield Young in his welcome remarks placed the urgent need for rural development in the context that “our urban spaces occupy about 52% of Jamaica’s population.” The Dean noted that one response to the existing “crammed urban spaces” is the kind of collaboration that has been forged between UTech, Jamaica and RADA. Prof. Stephen Vasciannie, CD, President, UTech, Jamaica in welcoming the partnership said that “as Jamaica’s National University, UTech shares unequivocally in the Government of Jamaica’s thrust to focus on strategies to significantly develop the country’s rural communities.” Prof. Vasciannie in pointing to a number of longstanding issues that have faced rural communities in Jamaica remarked that “we need to move to a situation in which we accept that rural communities constitute economic drivers for development in the country.” He noted that targeted development in rural communities should focus more attention on areas including tourism, sports, agriculture and fisheries and access to good health services, roads, water, technology and education. RADA’s Chief Executive Officer (CEO) Mr. Peter Thompson said that the graduate study programme will foster practical solutions to challenges impacting rural communities. He pointed to a number of global examples of partnerships between industry and academia that have resulted in solutions to problems faced by communities. He noted that UTech, Jamaica’s “practical and hands-on approach” to the course of study augurs well for advancing RADA’s strategic objectives for capacity building, knowledge sharing and other areas of cooperation in enhancing rural development. Dr. Amani Ishemo, Associate Professor, FOBE who has been leading the development of the MSc in Integrated Rural Development, with RADA since June 2016, provided an overview of the graduate programme. Dr. Ishemo in emphasising the importance of rural development to Jamaica’s economic growth noted that the programme will not focus only on agricultural development, or any one sector, but will have an inter-related emphasis on all aspects of rural development. These will include practical issues related to entrepreneurship, mitigating vulnerability to foster resilience in communities, disaster management, issues related to climate change and other areas aimed at driving higher levels of productivity in rural areas. Dr. Ishemo indicated that the course of study will comprise 56 credit hours, 10-12 modules and will be for duration of 18 months. Participants are also expected to be engaged in several projects with select international agencies. The full course proposal is to be subsequently submitted to the University’s Academic Board.